HG Contemporary Gallery announced its art collaboration with JADE Sixty, a new Asian Steakhouse, developed by well-known restaurateurs, Stratis Morfogen and Franco Moscato. Executive Chef Skinny Mei, former chef at Jue Lan Club and Philippe, and Chef Albert Diaz, former chef at Zuma London and Miami, are overseeing the kitchen. The menu will offer American steakhouse, such as aged prime meats paired with many well-known Asian favorites. Philippe Hoerle-Guggenheim’s tightly curated art collection includes works from Basquiat, Ilan Adar, Maria Luis Hernandez, Maria Jang, John Lennon and Olga Tobreluts. 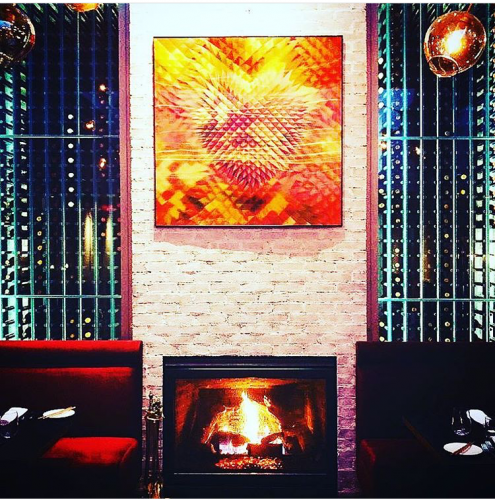 “I cannot think of a more perfect pairing than breakthrough contemporary art from some of the world’s best artists and world-class Asian fusion in a steakhouse setting,” said Philippe Hoerle-Guggenheim, Founder & Owner of HG Contemporary. JADE Sixty’s expansive two-floor space has 175 seats. The spacious bar area, with 15 seats, provides guests with access to the full menu. JADE Sixty also features a private dining room with artwork selections from HG Contemporary accommodates up to twenty guests. Here patrons can tailor an à la carte or pre-fixe menu for their group and enjoy a rotating collection of contemporary art for sale that has been curated especially for Jade Sixty by Philippe Hoerle - Guggenheim. The first HG Contemporary collection reflects the theme of music and includes original John Lennon works and Basquiat prints. The restaurant is located at 116 E 60th Street, New York, NY 10022. Hours of operation are Sunday - Wednesday, 11:30AM – 12:00AM; Thursday -Saturday, 11:30AM – 1:00AM. Delivery orders can be made on Caviar, Seamless and Postmates. Follow JADE Sixty on social media: @jade60nyc, #jade60.